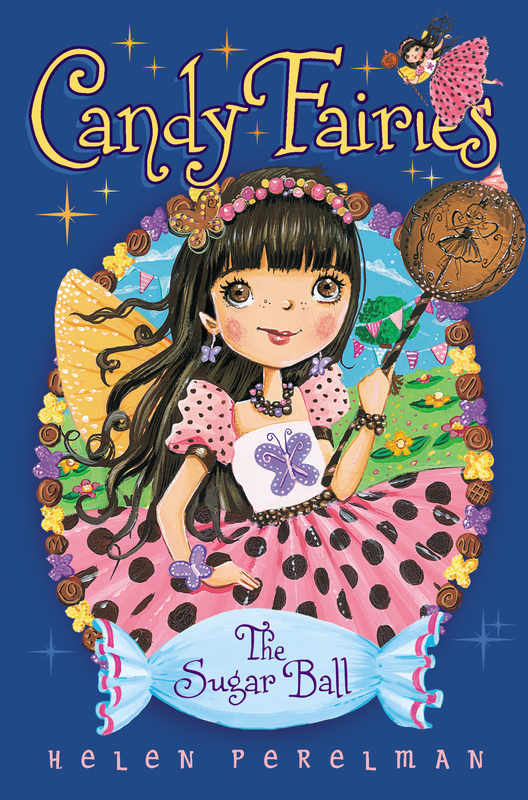 Chocolate chaos threatens to cancel the Sugar Ball—but the Candy Fairies are on the case! In preparation for the upcoming Sugar Ball, all of the Candy Fairies are making fabulous new dresses to wear and candy treats to share. Cocoa wants to make her outfit extra special (to impress the Sugar Pops, her favorite boy band), so she creates a magical chocolate wand to match her stunning new gown. But things go wrong when she loses her wand and it ends up in the wrong hands. Now Sugar Valley is a total chocolate mess! There are chocolate puddles everywhere and the spring candy crops are all smudged with chocolatey goo. Can Cocoa and her friends find the culprit and clean up the mess before the Sugar Ball is canceled? Cocoa smiled as she flew across Chocolate Woods. The sun was shining and the air was full of sweet, rich chocolate scents. The Chocolate Fairy spread her golden wings and glided down to Chocolate Falls. Yum, thought Cocoa as she licked her lips. There was nothing better than fresh milk chocolate. “Cocoa!” Melli the Caramel Fairy called. “Over here!” Melli was sitting underneath a chocolate oak tree. She waved to get Cocoa’s attention. Waving back, Cocoa fluttered down to her friend’s side. Melli was always on time—or early. She was a shy fairy, but her sweet caramel nature was part of what kept their group of friends sticking together—no matter what. “What a choc-o-rific day!” Cocoa sang. She smiled at her friend. “Only one more week until the Sugar Ball,” Melli burst out. “I can’t wait!” She took out a light caramel twist from her bag. “What do you think? I just had to show you right away.” She held up the long caramel rope candy for Cocoa to view. “It looks delicious,” Cocoa commented. Cocoa laughed. All any of her friends could think about was the Sugar Ball at Candy Castle and the dresses they’d wear to the party. The big ball was the grandest—and sweetest—of the season. The Sugar Ball was a celebration of the sugar harvest. Fairies from all over came to the Royal Gardens for the party. Princess Lolli, the ruling fairy princess, always made the party the most scrumptious of the year. Cara was Melli’s little sister and always wanted to be just like her big sister. “Did you help her?” Cocoa asked. “You should ask Berry to make you one of her sparkly fruit-chew necklaces,” Cocoa said. She was used to her friend Berry the Fruit Fairy always talking about fashion, but this year all her friends were concerned about their Sugar Ball dresses and jewelry. Everyone wanted to make her ball gown special and unique. Even Cocoa! “Hmm,” Cocoa muttered. She was actually growing a little tired of all the talk about dresses. Even though she wanted to look her best, she had another idea of how to make her entrance at the ball special. “Do you think Char will remember me?” Melli asked, interrupting Cocoa’s thoughts. Her light brown eyes had a faraway gaze. Like most fairies in Sugar Valley, she loved the Sugar Pops. They were brothers who played in a band together and sang the sweetest songs. Char was the lead singer in the band and Melli’s supersweet crush. “How could they forget you?” Cocoa asked. “You were the Candy Fairy who saved Caramel Moon!” In the fall, when the candy corn crop was in danger, Melli was the one who discovered the problem. Together with their fairy friends, they saved the Caramel Moon festival, where the Sugar Pops played. They even got to meet Carob, Chip, and Char! Seeing them again at the Sugar Ball would definitely sugarcoat the night. Looking down at her bag, Cocoa smiled. There were a couple of strands of marshmallow threads sticking out of her chocolate weave bag. “I was down at Marshmallow Marsh this morning,” she explained. Raina the Gummy Fairy was their good friend, who loved to read. She had nearly memorized the entire Fairy Code Book! Melli pulled the round mold out of her bag and gave it to Cocoa. “I was wondering what you were going to do with this,” she said. “I think you’re right.” Melli nodded. “I can’t wait to see that chocolate wand!” Melli cried. “Thanks,” Cocoa replied. She swept up her bucket and headed back to Chocolate Woods. She had lots of work to do before Sun Dip tonight. A chocolate magic wand was no small task. And Cocoa wanted to make sure it was going to be the talk of the Sugar Ball.